Donkeys and mules can make wonderful pets for the right owner. A mule is a cross between a jack donkey and a female horse, while a hinny is a cross between a horse stallion and a jennet donkey. Donkey, mule or hinny, these equines tend to be tougher than horses, while consuming less feed. They make suitable riding, driving and packing animals. Donkeys come in a wide range of sizes, from the miniature to the mammoth. Standard donkeys range between 9 and 12 hands, with miniatures below that height and mammoth donkeys standing 14 hands and up. Those donkeys falling between the standard and mammoth heights are known as "large standards." That means there's a suitably sized donkey for those desiring a riding animal, while smaller donkeys can pull a cart with kids or adults in it. Mules also vary in size, depending on the donkey/horse cross. Miniature mules are a cross between miniature donkeys and miniature horses, while draft mules result from mating a mammoth jack to a Belgian, Percheron or other heavy mare. Cross a donkey with a gaited horse and you should end up with a gaited mule, a popular riding animal. How can you tell if your potential pet is a mule or a hinny? According to the American Donkey and Mule Society, there's no truly reliable way to do so, but hinnies are much less common. If you've got a male donkey or mule, gelding is a necessity. Since mules are sterile, they are usually gelded as they can't reproduce but still feel those urges. There's no reason to keep a jack donkey unless you intend to breed him. Intact male donkeys can never be truly trusted. The American Donkey and Mule Society makes this clear, as it states that a stud mule "can be one of the worst animals you have to deal with," while a jack donkey "should not be a pet." For best results, castrate a mule or donkey before they're 2 years old. It's amazing what a little "brain surgery" can do for a male donkey or mule in terms of behavior and temperament. Donkey and mules are long-lived, with many living into their 40s. Good care keeps your pet around for a long time. They require the same vaccinations, deworming and regular hoof trimming as horses. Most donkeys and mules don't require grain, unless they are in heavy work. They do well on pasture or grass hays. Donkeys are prone to laminitis, so avoid putting them on rich grass. Obesity is also common in donkeys, so take care not to overfeed them. 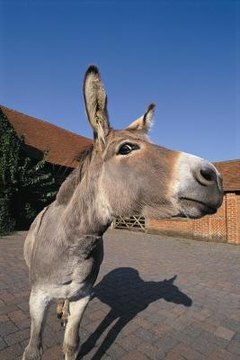 American Donkey and Mule Society: Geldings - Mules, Donkeys, and Castrating the Jack.